If you are a teacher of grades K–6, you may be asking, "Should I teach grammar in my classroom on a daily basis? How would I go about doing this? And how can I teach grammar so it isn't boring to my kids?" 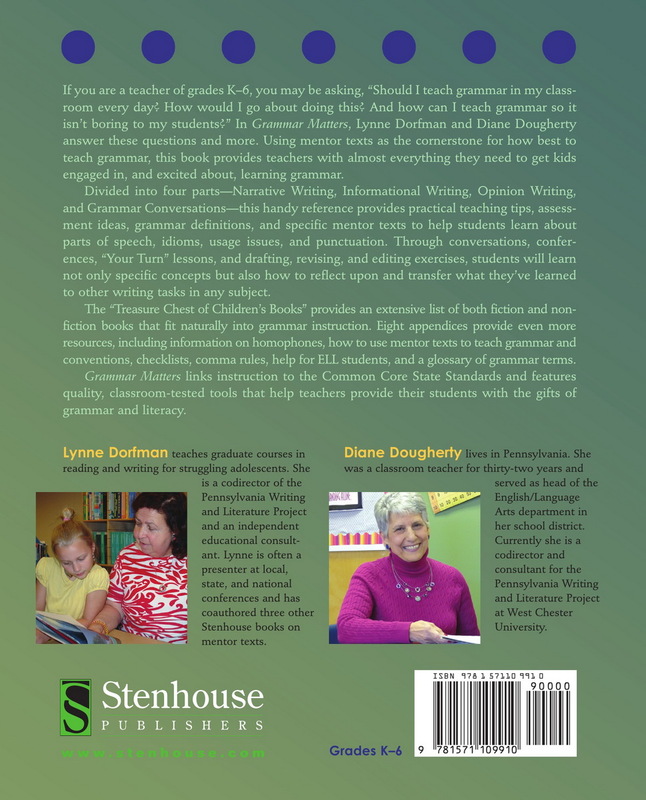 In Grammar Matters, Lynne Dorfman and Diane Dougherty answer these questions and more. 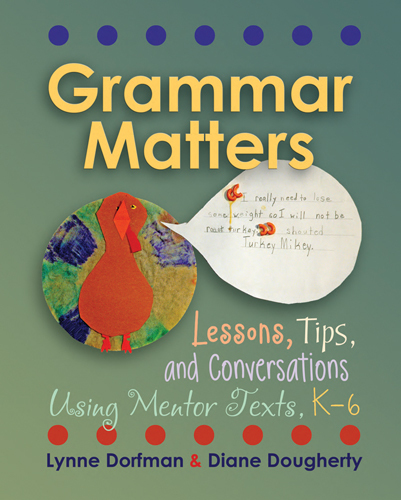 Using mentor texts as the cornerstone for how best to teach grammar, this book provides teachers with almost everything they need to get kids not only engaged but excited about learning grammar. Divided into four parts—Narrative Writing, Informational Writing, Opinion Writing, and Grammar Conversations—this handy reference provides practical teaching tips, assessment ideas, grammar definitions, and specific mentor texts to help students learn about parts of speech, idioms, usage issues, and punctuation. Through conversation, conferences, "Your Turn" lessons, and drafting, revising, and editing exercises, students will learn not only specific concepts but also how to reflect up and transfer what they've learned to other writing tasks in any subject. The "Treasure Chest of Children's Books" provides an extensive list of both fiction and nonfiction books that fit naturally into grammar instruction. Eight appendixes provide even more resources, including information on homophones, using mentor texts to teach grammar and conventions, checklists, comma rules, help for ELL students, and a glossary of grammar terms. Grammar Matters links instruction to the Common Core State Standards and features quality, classroom-tested tools that help teachers provide their students with the gifts of grammar and literacy. Pair with the video Getting into Grammar for a complete PD resource on teaching grammar.